Location: The best way to experience this part of the tour is to drive to WCNB Tour Stop 3 [ Waypoint = N37 06.048 W93 24.279 ] and then proceed to the points of interest on foot. From the parking area at tour stop 3, follow the walking trail leading off to the west towards Wilson's Creek. When you reach the Wire Road, you will see a sign pointing to the right. 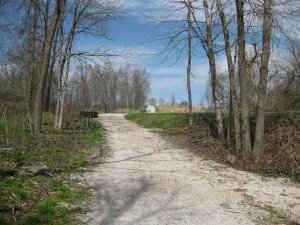 Take this trail up the hill to the historical marker. The National Park Service has a historical marker [ Waypoint = N37 06.216 W93 24.346 ] and a Model 1861 Rifled Gun at this location. Look to the west and you can see Bloody Hill. The Pulaski Light Battery would duel with the Union batteries led by Totten and Du Bois located over there on Bloody Hill. According to Hess et al. 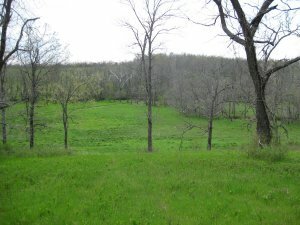 in their Wilson's Creek Battlefield Guide, this is actually the location of the Winn Farm that Confederate General Ben McCulloch used as his headquarters. They say the Pulaski Light Battery was actually located northeast of this location [ Waypoint = N37 06.312 W93 24.135 ]. You can get near this location by walking back to the Wire Road and turning left and heading northeast towards the Ray House. The battery was located jut to the west of the Wire Road in the vicinity just before you get to the WCNB Tour Loop Road. Unfortunately, there is not a lot to see here, for the area is overgrown with woods. It was much more open back in August of 1861. Although it may not be the exact location of the battery, you do get a better sense of the view that Woodruff had on the Union positions up on Bloody Hill back at the historical marker. 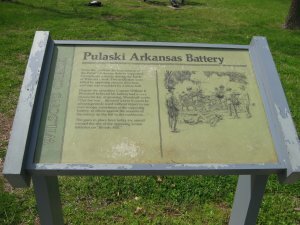 Description: The Pulaski Light Battery, commanded by Confederate Captain William E. Woodruff, Jr., was part of the Arkansas State Troops commanded by Brigadier General Bart Pearce. 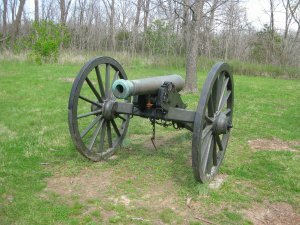 The battery contained two Six Pounder Model 1841 Smooth Bore Guns and two Twelve-Pounder Model 1841 Smooth Bore Howitzers. They would play a key role in the Battle of Wilson's Creek. 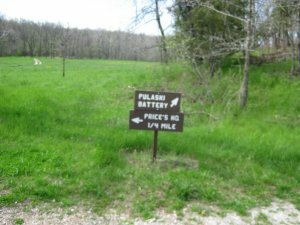 August 10th started with the men of he Pulaski Light Battery camped on the eastern side of Wilson's Creek just to the north and east of the Winn farm house. The men of the battery were just about to eat breakfast when they heard the sounds of battle to the northwest. This was Lyon's attack on the Confederate cavalry on the northern slopes of Bloody Hill. Soon Woodruff saw Union artillery on top of Bloody Hill. The Union battery began firing on the Confederates that were retreating down the southern slopes of Bloody Hill. Not waiting for his superior's orders, Woodruff quickly ordered his battery to unlimber and open fire on the Union battery. The opposing batteries dueled for the better part of an hour. Woodruff's quick response bought time for the Confederates to prepare a counterattack against the Federals on Bloody Hill. 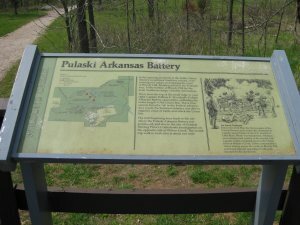 Without the response by the Pulaski Light Battery, the Federals may well have been able to sweep the field following their surprise attack on the Confederates.